Fisherman's Cove is a very rare Siesta Key condo where every unit has direct, unobstructed, full Gulf views. The building is one of the closest condos to the Gulf on all of Siesta Key. 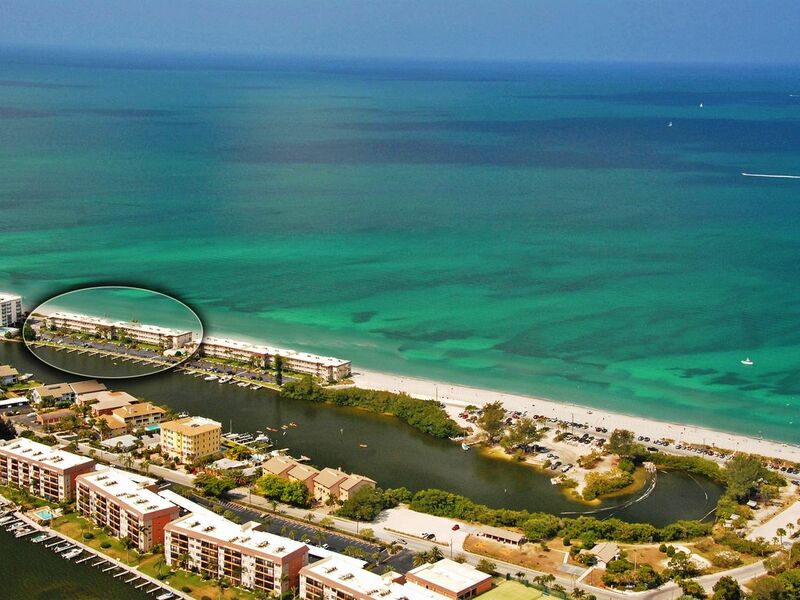 You could throw a tennis ball into the gulf from this Siesta Key beachfront condo! Located at Turtle Beach on the island of Siesta Key off Sarasota, Florida, this vacation home has the best of both worlds - the beach in front and boat docks with access to the Intracoastal Waterway in back. Fisherman's Cove is practically surrounded by water! While not as powdery white as Crescent (Siesta) Beach, it is less crowded and great for collecting shells. This rare 3-bedroom unit is on the third floor, accessible using the elevator or outside stairwell. This unit has been updated. Flooring is a mixture of modern tile, wood (parquet) in the living spaces and carpet in the bedrooms. The kitchen has solid-surface material countertops with tile backsplash, and modern appliances including refrigerator with through the door ice/water, glass top range and oven, dishwasher and microwave. The kitchen is fully equipped including a range of small appliances. The dining area has seating for six and is located right off the kitchen. The living room is well appointed with leather sectional, accent chair, large flat panel HDTV and an amazing view out to the lanai and the Gulf. The air-conditioned lanai has floor to ceiling glass sliders overlooking the Gulf of Mexico and the beach below. The lanai is furnished with a love seat and 4-person table to let you get comfortable as close to the water as possible. Sleep at night with the ocean surf right outside your window! The master bedroom has a bay window overlooking the Gulf and beach below. It has a king-size bed, large HDTV, walk-in closet, and en suite bathroom with a large tiled shower. The second bedroom has a king-size bed, and the third bedroom has two twin trundle beds (4 twins). The second and third bedrooms have flat panel HDTVs, and each have a large window overlooking the bay and boat docks. These bedrooms share a full bath with tiled tub/shower combo. Fisherman's Cove is located less than 25 minutes from Sarasota airport, 90 minutes from Tampa, and two and a half hours from Orlando. Tons of great restaurants and golf courses are nearby. Fisherman's Cove is on the southern end of Siesta Key at Turtle Beach and is very quiet and un-crowded. The view is to the west for spectacular sunsets! It's not unusual to be able to watch dolphins swim by in the Gulf from the lanai / patio. Note: Rates based on occupancy of 6 - additional occupants $70/week up to max occupancy. We offer a unique collection of family owned and operated premier rental units. From Gulf front units on Crescent Beach and at Turtle Beach, to a townhouse across from the powder white sands of Siesta Key Public Beach, to some terrific properties in the heart of Siesta Village. One-bedroom units for a romantic getaway or 14-bedrooms for a family vacation. Key West style units, luxury beachfront condos and elegant townhomes. From the southern to the northern ends of Siesta Key and a couple in between. Whatever you need...chances are we can help! Our philosophy We provide a premier - top value vacation rental experience (from budget to luxury) on Siesta Key. Services Top shelf amenities. All of our units include, large flat panel HDTV's, Free WIFI, Heated Pool, XBox or Wii Game Consoles, DVD/Movie library, fully equipped kitchens, beach chairs, beach wagons (except beachfront units)... Almost all have washer/dryers in the unit. We strive to have the best equipped units on Siesta Key. We've vacationed at beaches all over the world. When we visited Siesta Key we fell in love. We bought our first vacation home on Siesta Key in 2001. 1 king, 1 King, 4 twin, Pool (shared); 4 cable TVs; full kitchen, refrigerator, ice maker; shuffleboard; boat slip; XBox game. Information received was very clear. Check in and check out procedures were explained very well. When we got there we noticed glass and a shower door missing so we informed the maintenance guy right away and he was knocking on our door within the hour! Very nice guy. Plenty to do but we just enjoyed the beach. Accommodations were beyond my expectations. This is definitely the place to stay. Very quiet and very relaxing. Thank you for your review! Fisherman's Cove is a GREAT location and we love it too! Come back to see us! Great views, nice upgrades, well appointed!! We had an excellent stay at Fisherman’s cove. Despite the cool temps, the heated pool was perfect for us and our kids. The unit has nice furniture and flooring. Plenty of places to sleep. Everything was fully stocked. The management is quick to respond to any questions! We’ll look to stay here again! We look forward to seeing you again! Thanks for the review! This was a great condo. Had everything we needed and more. The kitchen was completely stocked with anything we needed for cooking. The views from the lanai were amazing. We spent so much time in there with the sliders open listening to the ocean. We never even went to Siesta Key Beach because Turtle Beach was so peaceful and relaxing. It isn't a large beach but has great seashells and the most amazing sunsets. Booking was very easy and they were great for accommodating every thing we needed. No check-in or check out needed, just drive straight to condo and walked right inside. Tampa was an easy drive to Busch gardens and we went to Tampa Power Plant at Apollo Beach to see all the manatees which was quick day trip. Myakka State Park was only about a 15 minute drive down the road. Lots of alligators and birds for the nature lovers. Close to everything you need but far enough to feel secluded and private. We will be back and definitely will stay at Fisherman's Cove again. Thank you for leaving a review and for the information on things to do in the area! We love Siesta Key and enjoy hearing what our guests are doing. The moment we walked in we were drawn to the rear windows. The view of the gulf coast was absolutely amazing. I was very impressed by the size of this condo and loved the extra amenities such as the cooler and beach chairs and float. I was most impressed by the sunsets. The glow of the sky makes the home an impressive shade that I will never forget. Truly amazing condo. My family loved their summer vacation of 2018! Thank you for choosing to spend your vacation with us. We know you have lots of options! I am a repeat customer and have always had a satisfactory stay at Fisherman's Cove. Our unit is always clean and has everything to get you started. Will definitely return. Kathy, return guests are our favorite guests! Thank you for continuing to vacation with Sunnyside Properties! This was our fourth year coming to Fisherman's Cove and we've already booked our 2019 vacation. The condo is perfect for our needs. Having a grandchild with us, a washer and dryer are very much appreciated. Having a morning cup of coffee while looking out at the Gulf is amazing. Every time we've come, the other guests have been wonderful. It's a short ride from Siesta Key Village. What more could you ask for? Bob, thank you so much for continuing to stay with us. We appreciate you! Activities (on site or nearby): hiking, biking, golf, tennis, racquetball, fitness center, gym, shuffleboard, miniature golf, amusement parks, fishing, hunting, wildlife viewing, horseback riding, shopping, restaurants, live theater, cinemas, museums, sightseeing, swimming, snorkeling/diving, boating, sailing, waterskiing, surfing, windsurfing, parasailing, jet skiing, shelling.